The fossil record of centrosaurine ceratopsids is largely restricted to the northern region of western North America (Alberta, Montana, Alaska). Exceptions consist of single taxa from Utah (Diabloceratops) and China (Sinoceratops), plus otherwise fragmentary remains from southern Laramidia. 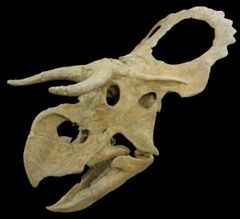 Here we describe a remarkable new taxon, Nasutoceratops titusi n. gen. et sp., from the late Campanian Kaiparowits Formation of Utah, represented by multiple specimens, including a nearly complete skull and partial postcranial skeleton. Autapomorphies include an enlarged narial region, pneumatic nasal ornamentation, abbreviated snout, and elongate, rostrolaterally directed supraorbital horncores. The subrectangular parietosquamosal frill is relatively unadorned and broadest in the mid-region. A phylogenetic analysis indicates that Nasutoceratops is the sister taxon to Avaceratops, and that a previously unknown subclade of centrosaurines branched off early in the group’s history and persisted for several million years during the late Campanian. As the first well-represented southern centrosaurine comparable in age to the bulk of northern forms, Nasutoceratops provides strong support for the provincialism hypothesis, which posits that Laramidia—the western landmass formed by inundation of the central region of North America by the Western Interior Seaway—hosted at least two coeval dinosaur communities for over a million years of late Campanian time.